It seems the world has gone mad. At least the world of M.A.C fans. This year Rihanna teamed up with M.A.C to make a staggering 4 collections, spread out over the rest of the year. 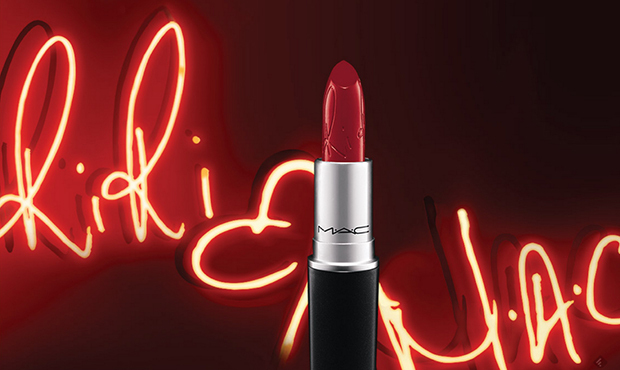 The lipstick 'RiRi Woo', which is a take on the permanent Ruby Woo shade, is present in all 4 collections. It recently went live online only and sold out in less than 3 hours. M.A.C clearly knew it was going to be hit as they'd made it 1 lipstick per order. Since then eBay is rife with people trying to sell this. The original £14 lipstick is being sold from anywhere between £30 right up to £100. Absolutely ridiculous. It's being bought back another 3 times this year, who in their right mind would pay that? I think it's a poor job on M.A.C's behalf that they let people place multiple orders from the same account, to the same address. Maybe that's just me but I think they should've had something in place to stop people buying 3 or 4 lipsticks and selling them for way over the odds. It's just not fair to those who did want it. Though people have said the difference between RiRi and Ruby is hardly noticeable. So maybe it's worth checking out the original?